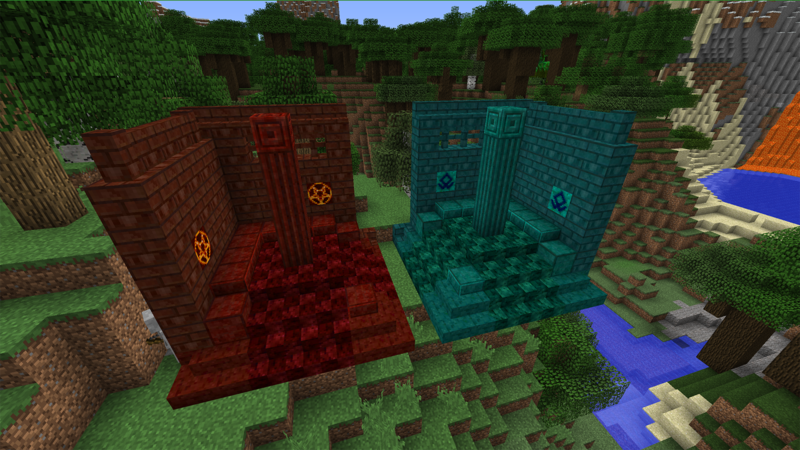 These blocks come in various forms: Stone, Brick, Tile, Polished, Pillar, Chiseled and Crystal (light source). Stone, Brick and Tile also come as: Stairs and Slabs. Brick can also be crafted into: Fences and Walls. Added a new Blocks creative tab for Lycanites Mobs. Fixed a server side crash caused by solid blocks added by this mod, this also fixes a bug where the solid blocks can be passed through by entities in SSP or LAN. Possibly fixed a crash caused by Belphs and Behemoth receiving float instead of integers from the network. Rare subspecies health bars are now disabled by default again. Reduced the rare subspecies weight from 5 down to 2, this should make them more than twice as rare than there are already as I have noticed too many Lunar Grues and Umber Lobbers are spawning. I may review these default weights further later. The config will need to be manually deleted or updated for these changes. ============================================================ Lycanites Mobs Update: The Return 1.9.4 - Version 1.14.1.1 for Minecraft 1.9.4 Configs older than 1.14.0.1 will be reset. ============================================================ -------------------- New Features: -------------------- All all new building blocks: Demonstone and Shadowstone These blocks come in various forms: Stone, Brick, Tile, Polished, Pillar, Chiseled and Crystal (light source). Stone, Brick and Tile also come as: Stairs and Slabs. Brick can also be crafted into: Fences and Walls. Added a new Blocks creative tab for Lycanites Mobs. -------------------- Major Fixes: -------------------- Fixed a server side crash caused by projectiles. Fixed a server side crash caused by solid blocks added by this mod, this also fixes a bug where the solid blocks can be passed through by entities in SSP or LAN. Possibly fixed a crash caused by Belphs and Behemoth receiving float instead of integers from the network. -------------------- Config Changes: -------------------- Rare subspecies health bars are now disabled by default again. Reduced the rare subspecies weight from 5 down to 2, this should make them more than twice as rare than there are already as I have noticed too many Lunar Grues and Umber Lobbers are spawning. I may review these default weights further later. The config will need to be manually deleted or updated for these changes.